It took time and effort to finally publish your website or a page. You are a proud mama or papa of what you have created. However, within the first-week traffic to your website seemed slim. Now a whole month has passed and still, the crowd isn’t building as per your expectations. What could you be possibly doing wrong? Actually, this has to do more with what you are possibly not doing. Ever heard of Search Engine Optimization (SEO)? Well, you must have heard of it, that is why you ended up here! But do you really know what does it mean? In case if you don’t know about it; The Search Engine Optimization (SEO) is a technique of pushing your website to the top of the rankings in terms of what pops up during a search on a search engine. The search engine displays result using the keywords. In addition to keywords, search engines also evaluate information such as the duration of a viewer’s visit, bounce rate, broken links, pages viewed and inbound and outbound links. I have written 10 important SEO Tips in this article, which I have tested myself on my websites. I am 100% sure that if you will optimize your website with my SEO Tips carefully, you will get your website ranked among the top on google within a week. This article will also help you to get your website ranked higher on search engines. The niche of your website is very important to rank your business higher on google. Going too wide will definitely take too much time, research & money. Your website can entail number of topics but always choose one primary topic that is most important for you to get ranked. Doing SEO Keyword Research can help you to choose one primary topic. For keyword research, you can use the Google Keyword Planner Tool. Keyword research is a part of On-Page SEO which is a separate topic. I will explain “how to do keyword research” in the next On-Page SEO article. The age of a domain is an important factor in the Google search engine algorithm. It is like when you get into a new relationship with your partner it surely takes time to trust each other. Google acts in the same way. When you buy a new domain and triggers it for the first time, Google takes time to trust your domain and to display it properly. It doesn’t mean that you start losing hopes, in case your domain is new! You can follow these SEO tips to make the process faster. I will also suggest you consult with SEO professionals to find out how they can help you to get better rankings with your new domain. You can always check your domain age by using online tools. Directly submitting newly published link on google using this: Google URL Crawler. The automated way to do that is to sign up for google webmaster tools and then register your website and submit your SITEMAP there. Bear with me and I will write on “How to Submit SITEMAP on google” in another section. Make sure that all of the pages on your website are accessible from your homepage. If you don’t see any of the pages on your homepage then chances are that the search engine crawler will not see them either. Make sure to add link of all the pages on your website header(menu) and cross-link them. The URL structure & hierarchy of your website should be well designed. Read a brief article on How to create a site structure & why is it important? According to a digital marketing company in USA; nearly 60% of the website traffic comes from mobile devices. So your website should be responsive to generate good business especially, for the online store. The google crawls and checks your website for both desktop devices and mobile devices separately. Google has an option to fetch your website for mobile devices separately. You want your website to be used by a large number of users. You also want your users to be able to navigate your website with minimum confusion. Designing a website with inconsistent fonts and unclear layouts will escalate the chances of directing the users to the next domain. To make your website clean and beautiful make sure that the fonts and font sizes are readable on various screens, use bold type and colors sparingly, break up your text with spacing and small paragraphs, and if necessary make a list with numbers or bullet points for clarity. If you think that you don’t have a good sense of fonts and colors then I suggest you hire a professional website design services for this important job. It is highly recommended that you use a custom 404 page on your website in order to not lose your potential customers. Be similar to your website design. Carry your header and footer. Display a message to the website user rather than just displaying the error message “Not Found”. Give the users an option to navigate to the other pages of your website. A 404 page is important for SEO too. 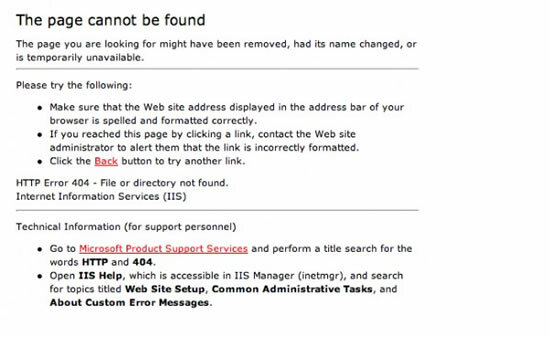 The crawlers will leave your website if they will get stuck on a blank 404 page. So, design a custom 404 page and provide links on it for robots to crawl. No one would like to click on a dead link or a 404 link. Check your links regularly, especially if they are outbound links. Outbound links are when you connect your article content with another website to give them credits or when you share a back-link with another website. Check those links on your website regularly to verify that their sites are up and running before you try to send your users there. I was personally using a chrome extension “Check my link” to avoid broken links on my website. There are many other link checker tools that can do your job pretty easily. Crawlers are observed to be impatient entities, which don’t wait long for your web page to load. They have a crawling time period associated with them for per page. If your website will not open in that duration the crawlers will leave your website without crawling it. The same goes for humans as well; do we really bother to wait long for a webpage to load? We would rather consider closing a tab if it did not arrive on time. So your page should be completely optimized. You can check your website speed and even optimize your website using these tools: Google Page Speed Test & GTmetrix. Let me know in comments if you need any help understanding these tools or optimizing your website speed. The most important factor of slow webpage loading are big images. If you have images on your webpage make sure that they are not in MBs. They should be in KBs. Do you know that you can decrease an image size by 80% or more without losing its quality? I suggest you keep your images under 200kb. As I promised that I will be writing about the sitemap. Here is a brief section on Sitemaps. What is a Sitemap? A sitemap is a list of pages of your website which will be accessible to the crawlers or users. A website should be based on the sitemap and It is recommended to design your sitemap during the process of website design. If your website doesn’t have a Sitemap yet, you still don’t have to worry. There are so many Sitemap generators online. One of them is www.xml-sitemaps.com. If your website is based on a CMS like WordPress then I will highly recommend you to use a plugin to do this job. I am using Yoast Plugin for my website’s on-page SEO. It is a free and powerful plugin which has the ability to generate a Sitemap and automatically upload it to your domain root. After generating and uploading your sitemap on your domain root. You can submit your sitemap to the google webmaster tools and then the google crawlers will automatically crawl your website. Depending on the update frequency you will set. Below picture will explain “how to submit your sitemap on google webmaster tool”. What to do after optimizing my website for SEO? Animated videos enhance your website’s search engine status mainly due to the fact that most major search engines like Google favor pages that includes videos. It’s proven that pages with video are more likely to receive back-links from better sources, check more benefits here – Animated explainer video company. Would you go for an older domain or would you go for a younger domain, but with higher DA? I am glad that you liked this article, Well older domain is always better to get you ranked on Google. However, if your domain is new then you should always go for high PR backlinks to make the SEO process faster. Thanks for taking the time to answer my question Shehryar!